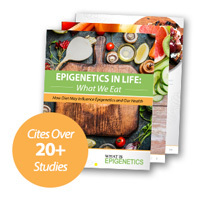 Selective Survival In The Womb Based On Random Epigenetic Variation May Explain Adult Health Problems | What is Epigenetics? It’s been said before that health begins in the womb. That’s because the conditions we encounter in utero impact not only our well-being in infancy but throughout our entire lives. But what happens when the nutritional environment in the womb is less than favorable? Most epigenetic studies have suggested that embryos respond to adverse environmental conditions by adjusting their gene expression. However, new research proposes something entirely different may occur. Instead of adapting to the environment, random variations in gene expression may allow some embryos a survival advantage. In a new study published in Cell Reports, an international team of researchers investigated DNA methylation (DNAm) signatures in early embryo to determine if selection, not plasticity, generated DNAm variation. Using a mathematical model of re-methylation, they demonstrated that a certain part of the DNAm pattern was missing among individuals that were exposed to an episode of famine. DNA methylation a is a key epigenetic mechanism that controls gene expression. It is formed with DNA methyltransferases and removed in an intricate series of reactions facilitated by TET enzymes involving the hydroxylation of a methyl group. While there is extensive evidence linking adverse maternal exposure during early development with enduring changes in DNAm profiles of offspring, the exact mechanisms involved are not fully understood. For the most part, two alternatives are usually considered: 1) adverse in utero conditions compromise DNAm, or 2) actively revised DNAm in the embryo permits a match between its phenotype and the environment. In this study, the scientists examined the second alternative as a possible explanation for associations made between adverse prenatal care and health issues in adulthood. They were motivated by the correlation that babies conceived during the Dutch Hunger Famine of 1944-45 suffered from poor cardiovascular health later on in life as adults. This has been attributed to epigenetic modifications or changes in gene expression that persisted throughout the survivor’s lives. The researchers believe that the interchange between epigenetics and embryo survival may be better explained by taking an evolutionary perspective. In evolution, random genetic variation is sorted out by natural selection and only variants that are best suited to the environment can endure. Using a computer model, the team showed that random epigenetic differences, like genetic mutations, are bound to happen. They suspect that DNAm variants occurring randomly may well increase an embryo’s likelihood for survival when the nutrient levels are low. And accordingly, those epigenetic variants may be showing up in cohorts that were exposed to famine during early gestational development. “We have always struggled to explain how early embryos would be able to modify specific epigenetic marks in response to nutrition. It is fascinating that selective survival based on random epigenetic variation fits the data best,” says Tobias Uller, author and evolutionary biologist at Lund University. While preventative prenatal measures should always be taken to minimize any adverse health effects, this study does suggest that such measures may only reduce those possibilities. It also shifts expectation about intervention programs and the ongoing discussion of blaming past generations for our own diseases. The authors believe that this particular biological mechanism, they have termed “epigenetic selection” should be further studied to better understand the underlying association of adversity in early life with poor health in adulthood. Source: Bastiaan T. Heijmans et. al. (2018) Selective Survival of Embryos Can Explain DNA Methylation Signatures of Adverse Prenatal Environments. Cell Reports, 25 (10): 2660. Reference: Columbia University’s Mailman School of Public Health. “Study Uncovers Evidence of Natural Selection in the Womb”. 05 Dec. 2018 Web.